Chateau Plince has one of the few, truly grand chateau in Pomerol. This is noticeable, because generally speaking Pomerol is the simplest of all the important Bordeaux appellations, thus most of the chateaux are humble in nature. But not here, In fact, it is safe to say that Chateau Plince sports perhaps the finest, most impressive looking chateau in the appellation! The grand chateau was originally constructed in the 19th century. Chateau Plince is owned by the Moreau family who purchased the Right Bank estate from the well known, Rouchut family. The Moreau family have owned other vineyards in Pomerol, including Clos LEglise, which they sold in 1977. The vineyard of Chateau Plince is planted to 70% Merlot and 30% Cabernet Franc. Previously, the vineyard had up to 5% Cabernet Sauvignon planted, but those vines have since been removed. The terroir is mostly sand with some iron in the soil. On average the vines are close to 23 years of age. The vineyard is planted to a vine density that remains close to 6,000 vines per hectare. The property is located close to Chateau Nenin and not too far from the RN89 highway. The Right Bank vineyard is 8.66 hectares. In an effort to produce better wine today, Chateau Plince now practices green harvesting and crop thinning to reduce yields as part of their vineyard management program. However, Chateau Plince remains one of the few vineyards with potential that are still harvested by machine. To produce the wine of Chateau Plince, vinification takes place in eight, traditional, temperature controlled, cement vats that range in size from 62 hectoliters up to 132 hectoliters. Malolactic fermentation takes place in barrel. The wine of Chateau Plince is aged in an average of 50% new, French oak barrels for between 12 and 18 months, depending on the quality, character and style of the vintage. 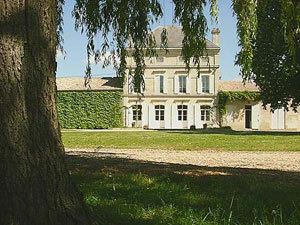 Chateau Plince produces close to 4,000 cases of Pomerol wine per vintage. There is a second wine, Pavillon Plince. While Chateau Plince is owned and managed by the Moreau family, the sales and marketing of their wine are handled by Ets. Moueix. Chateau Plince can be enjoyed on the young side with an hour or two of decanting. This allows the wine to soften and open its perfume. Older vintages might need very little decanting, just enough to remove the sediment. However, I find the wine is usually better with 4-6 years of bottle age. Of course that can vary slightly, depending on the vintage character. In the best years, Chateau Plince is usually at its best between 5 and 14 years of age after the vintage. Chateau Plince is best served at 15.5 degrees Celsius, 60 degrees Fahrenheit. The cool, almost cellar temperature gives the wine more freshness and lift. Chateau Plince is best paired with all types of classic meat dishes, veal, pork, beef, lamb, duck, game, roast chicken, roasted, braised and grilled dishes. Chateau Plince is also good when matched with Asian dishes, hearty fish courses like tuna, mushrooms and pasta. Chateau Plince is a lighter, early drinking style of Pomerol wine. The whisper of chocolate preceding the plums works well here. Medium bodied, forward and soft, you can enjoy this elegant Pomerol with just a few years of age. Medium bodied, silky, soft and polished, this is a respectable wine with lots of ripe plums, earth and freshness. Medium bodied and sightly rustic, with black cherry, plum and espresso bean notes throughout. Medium bodied, soft textured, open and ready for business, with a wealth of sweet, juicy plum, freshness, and black licorice.